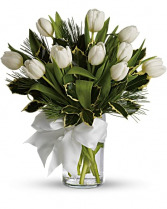 ALL IS MERRY & BRIGHT Holiday Bouquet in Southern Pines, NC - Hollyfield Design Inc.
For a wintertime bouquet that's as pure as the driven snow, send this unexpected gift of ten white tulips, accented with aromatic white pine, and adorned with a silver, white, or gold ribbon. 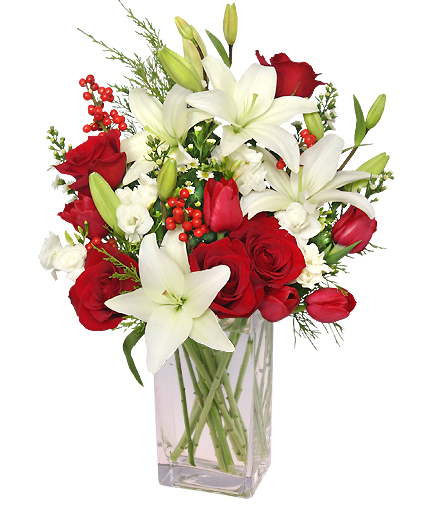 A simple pleasure for a peaceful season. 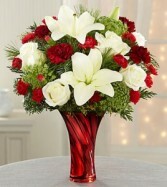 *This arrangement can also be made with red tulips or a mix of red & white. Please specify choice on order.